This book is a clarion call for revolution in the way breeders view, and breed, Egyptian Arabian Horses. THE PUBLISHER » read more.. THE EGYPTIAN ALTERNATIVE is a thought – provoking book for breeders of the Arabian horse and Egyptian Arabian..
Book available at DIWAN bookstores across Egypt. Book available in Europe through OLMS. Book available at The Arabian Magazine Shop - UK. 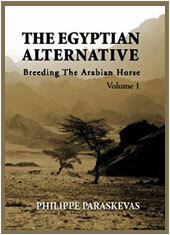 This book is a clarion call for revolution in the way breeders view, and breed, Egyptian Arabian Horses. In Volume I of ‘The Egyptian Alternative’ Philippe Paraskevas challenged many current notions about breeding and horse showing practices, his primary concern being to safeguard the future of the Egyptian Arabian horse. 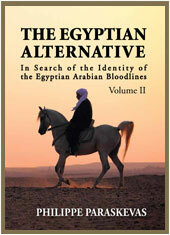 In his Search for the identity of the Egyptian Arabian Bloodlines, Paraskevas examines in great detail the E.A.O. bloodpool – its different strains and sire lines, its antecedents and potential. He delves into complexities of reading pedigrees, describing strains, sub-strains and horse families as well as the benefits of preservation breeding and outcrossing. This is a breeder’s guide to the detailed genealogies of different strains as this writer chooses to read the vertical charts. The author takes a critical look at the effect of the fragmentation of what once was simply the Desert Arabian into a multitude of sub-categories as defined by a variety of associations of breeders. He defines the principles and plan of action required to ensure the rebirth of the Desert Arabian and gives us hope that there is still a way forward. Chapter 3. The Broodmare Base of the E.A.O. Chapter 11. The Stallions of the E.A.O. The Legend Lives on … and on!